A litter of newborn puppies died from prolonged exposure to the frigid outdoor temperatures in Knox County, Illinois, just one day after Christmas, according to WQAD. 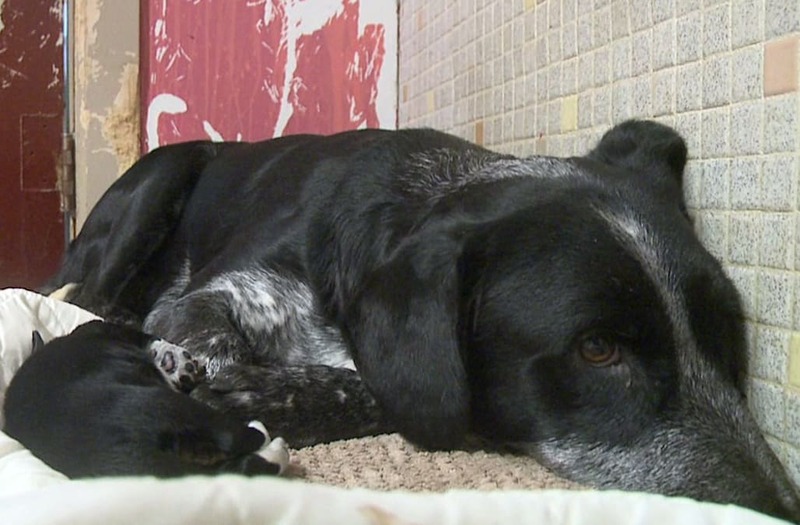 The black lab mix's owner had apparently been keeping her outside in below-freezing temperatures and didn't even realize she was pregnant until she gave birth on Dec. 26. After noticing the litter of puppies, the dog's owner called the Knox County Humane Society for assistance. Sadly, eight of the pups froze to death before rescuers were able to transport them back to the shelter, and only one from the litter survived. "I think it was just one of those unfortunate things where the dog just lived there and was just fed daily, and that was about it," said Curt Kramer, who works for the Knox County Humane Society. "It is sad when you lose animals like that... to know they probably would have been saved if they would have been inside or somewhere where it was warmer, rather than outside." Kramer also told WQAD that the mother dog was on the brink of dying from exposure, too. "Her body temperature was very low. It was below 95, and that's when you start worrying about hypothermia in a dog. Her skin was cold to the touch, her ears were cold to the touch," he said. Both the mother dog and her surviving puppy were surrendered to the humane society, where they will be treated and eventually put up for adoption.